This Three Cheese Spinach Strata is a cheesy, french bread filled, make ahead egg casserole that makes a hearty breakfast or brunch. Let's talk about how awesome breakfast casseroles are. You think they're totally awesome, right? How could you not? First, there's the fact that breakfast casseroles usually save you so much headache in the kitchen. I mean, think about it. You could make a traditional breakfast and try not to burn the toast while you're juggling a skillet full of eggs and a griddle spattering bacon grease everywhere. Or you could do a little prep, throw everything into a glass baking dish, and have a mimosa while the oven does all the work. I pick mimosas. Breakfast casseroles rule! So, now a little more about this little number here. 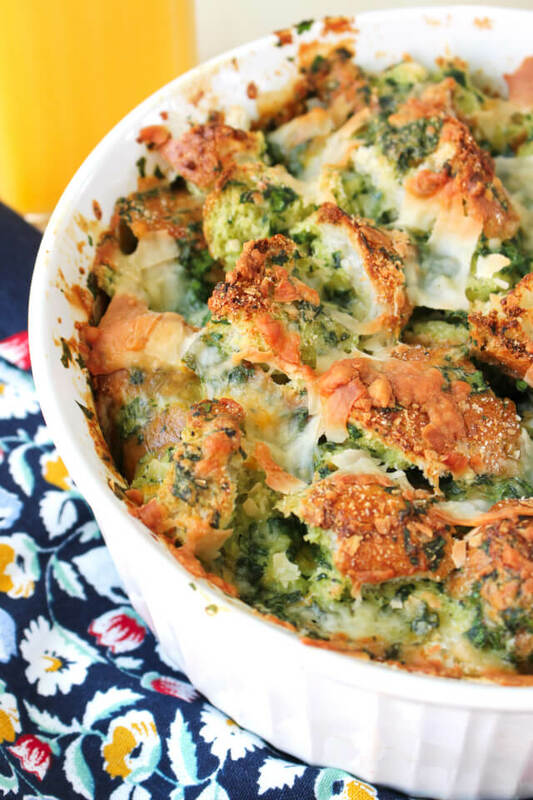 This cheesy egg and spinach strata is for the bread lovers in the house! Most breakfast casseroles have the usual egg and cheese and maybe some meat and veggies mixed in, but few casseroles throw all caution to the wind and toss in the toast, too. Or french bread, in this case. I mean, why not? I'm probably going to be enjoying my egg casserole with a side of bread anyway (carb lover for life), so why not just combine the two? I did. And you totally should, too. Did I mention that this recipe is a make ahead recipe? Again, breakfast casserole win. If you have an early breakfast planned, do your prep the night before and pop the whole thing in the fridge overnight and bake first thing in the morning. If planning a late brunch, prep at least four hours ahead of time the morning of and then bake when you're ready! Perfect. A few different things factor into the way your strata will turn out, like the size of your french bread loaf and the size of your baking dish, so be sure to check out the Notes section below where I talk a little bit about that. So, are you ready for a bread lover's breakfast? 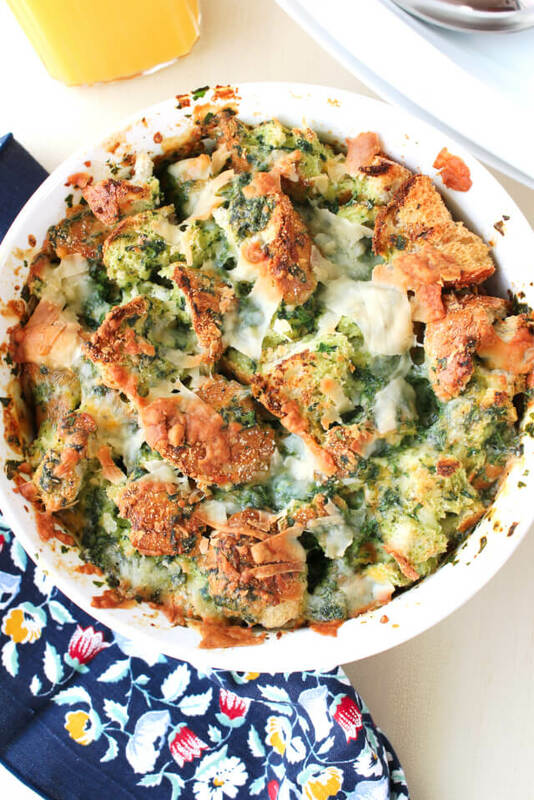 Try this Three Cheese Spinach Strata and long live the breakfast casserole! Grease a glass baking dish with butter. Fill the dish with the torn bread. Set aside. In your food processor or blender, pulse together the eggs, nutmeg, salt, pepper, and cubed cheese until cheese is crumbled. Add the spinach and continue to pulse until the spinach is chopped, stopping to push the spinach down if needed. Pour the egg mixture over the bread and gently stir to coat the bread. Cover and refrigerate for at least 4 hours or overnight. The cook time will depend on how much french bread you are using and the size of your baking dish. Depending on those factors, your strata will be more egg-y or more bread-y. Both are good! Less bread will require a shorter cook time. This strata is a great base for experimenting with different cheese combinations or for adding cooked vegetables like mushrooms, bell peppers, or tomatoes. Adapted from Spinach & Feta Egg Strata in the Nutri-Ninja Inspiration Guide.